This is a recipe I probably should’ve googled before starting this, rather than waiting until after I’ve made it! 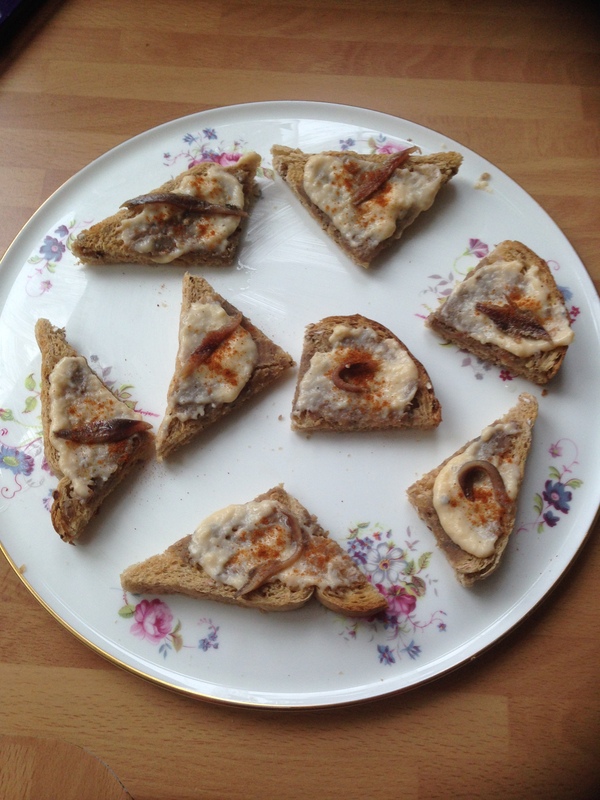 I did find a few references to this recipe and they all say it’s a savoury consisting of creamy, softly scrambled egg served over toast that has been spread with anchovy paste! I have to say I was totally thrown by the egg bit and I had been convinced it should not be scrambled!! 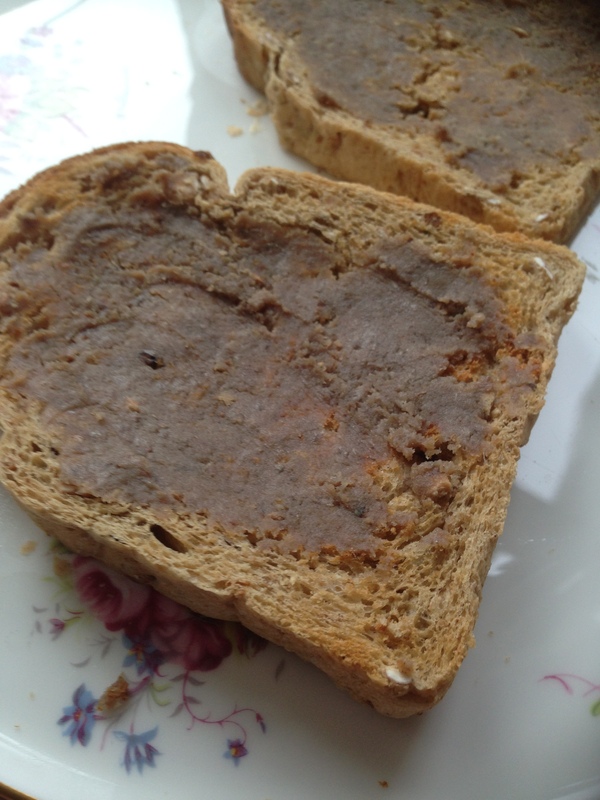 Anyway I started by seiving the anchovies, and I had enough to spread over two small slices of toast..
Then I started with the egg and milk mix, and I tried to cook as slowly and as gently as possible because I was thinking it shouldn’t scramble!! 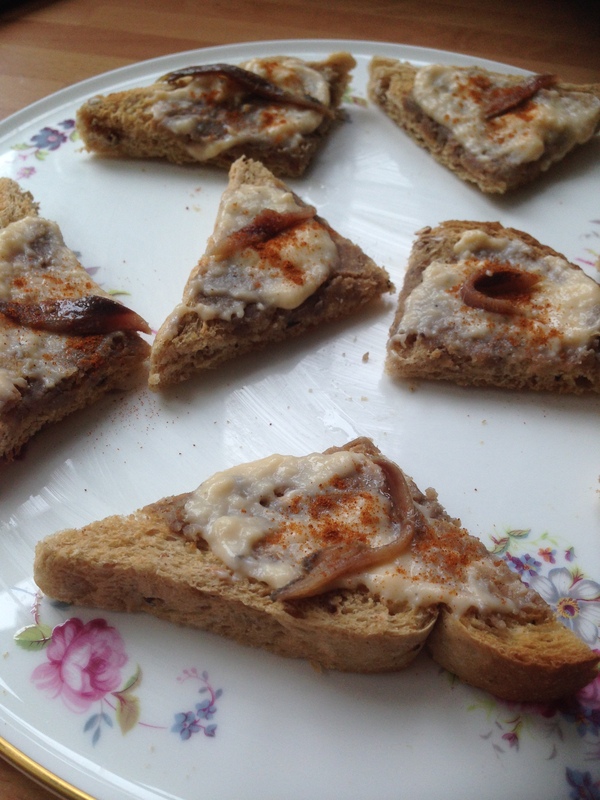 I did eventually end up with a thick creamyish looking mix that did have a bit of a scrambled consistency..
That was spread only the toast then I cut it into triangles and topped with some leftover whole anchovies and paprika.. I served this as an appetiser before dinner, but it actually comes in a sub chapter of after dinner savouries! Despite there being very little anchovy on each one it is very strong, it’s not like a strong fishyness but is very salty, which I quite like! I think I didn’t scramble the egg mix enough and should’ve had a thicker layer of that, but even in doing that I wonder if you would taste it over the strong anchovy! I think the idea is just to have a small portion each, and although I did enjoy this I couldn’t manage more than 2 small bite size portions! Would I make these again? Yes, but I’d cook the eggs a bit longer.. So what to have with champagne cocktails? I’d thought of doing something with oysters but think I’m still a bit scared of them! So opted for scallops instead.. This is only the second time I’ve cooked with scallops but I’ve been eating them more when in restaurants and do really like them! I am worried about both overlooking and undercooking! Anyway I got 6 scallops for the two of us.. They are sprinkled with salt, pepper and lemon juice..
Then each one is wrapped in a slice of streaky bacon.. I cooked them under the grill for roughly 5 minutes. I’d hoped to have some lovely pictures of the cooked scallops but as usual once it’s dark in my kitchen everything looks rubbish.. 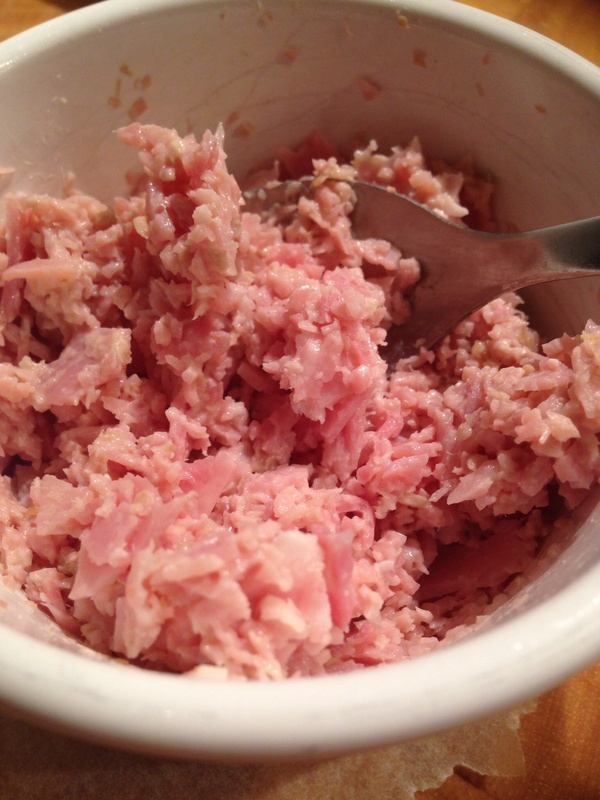 I did make a tartare sauce of sorts, I mixed mayonnaise with chives, gherkins and capers.. 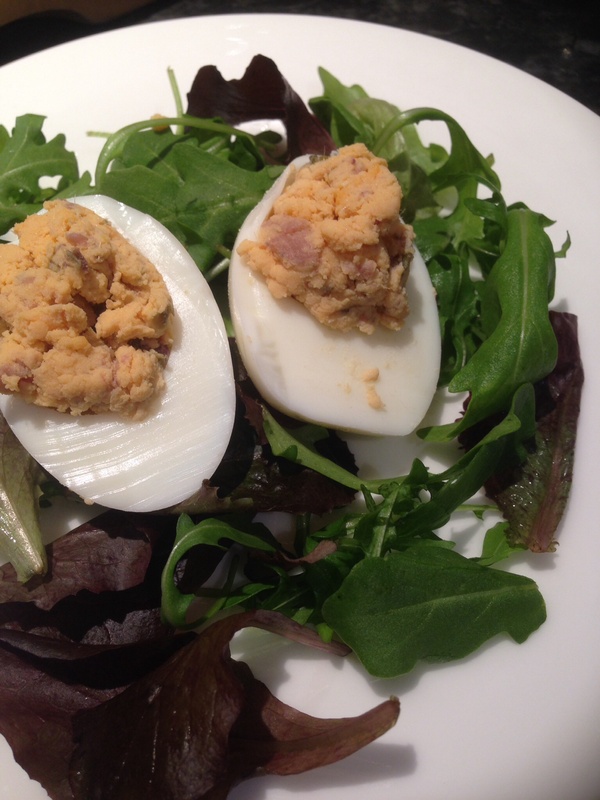 So this recipe is really meant to be an appetiser but I was making this for our tea! So what to serve with scallops and bacon…..chips! It’s may seem like a very unusual Tuesday night dinner, but I thoroughly enjoyed scallops and bacon with chips, washed down with champagne cocktails! The scallops were lovely and soft and quite sweet, which combined with the salty bacon is really good! I don’t think they were overcooked which is good, and am just wishing I’d made more! I wanted to make vol-au-vents to have as an appetiser but when I read the actual vol-au-vent recipe it says to make one big one! I wanted to make small individual ones which is apparently a bouchee!! 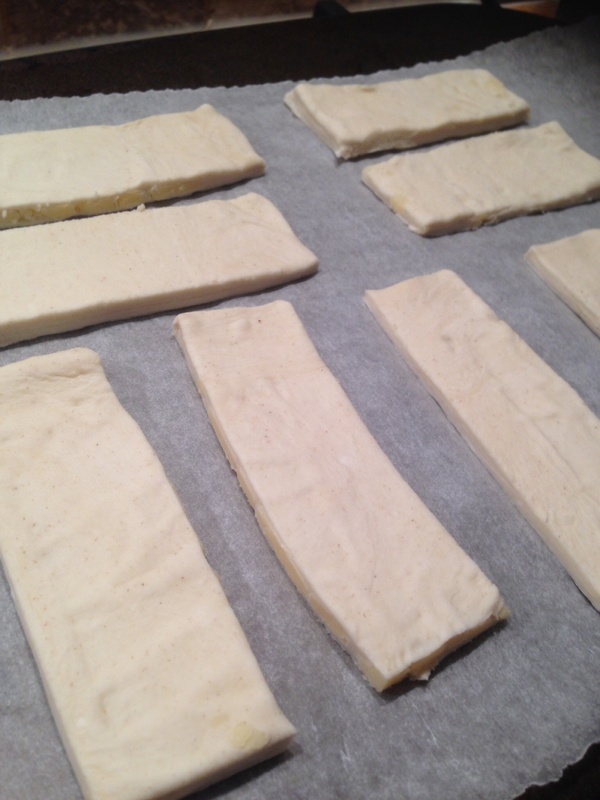 I opted to make flaky pastry, which is apparently the most common of the flaked types of pastry. The chapter gives some good pastry tips which I perhaps should’ve read before making the pastry! It says to handle lightly and as little as possible, I think I over handled it during the rolling and adding of the fat! I was also perhaps a bit heavy handed when rolling and cutting out the shapes..
Next I cut into each one with a smaller cutter.. 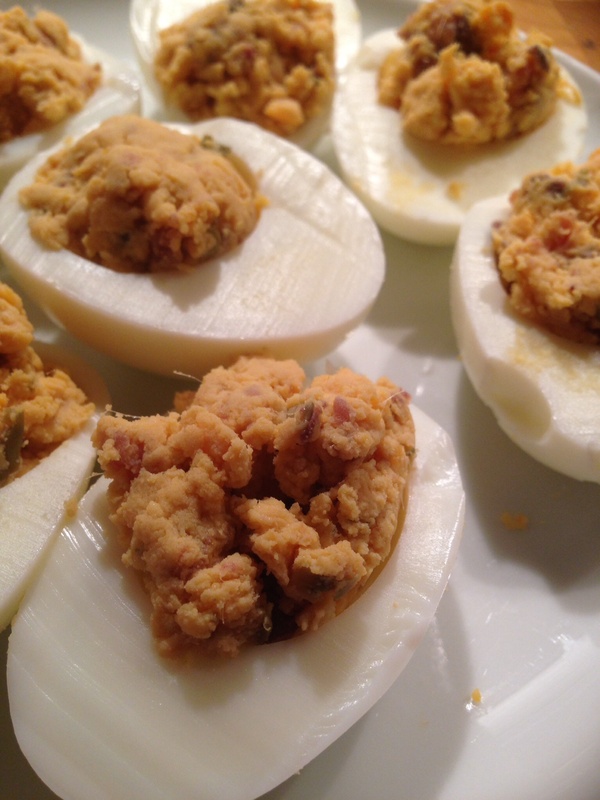 They were brushed with egg and then into the oven. After 15 minutes I had expected them to be really well risen but I was a tad disappointed..
I’m thinking the two reasons for this are that I over handled the pastry and I think I rolled it out too thin. I then cut out the centres of each one and tried not to eat all the inner bits of pastry! I opted to make a chicken and mushroom filling, then realised I had turkey instead! 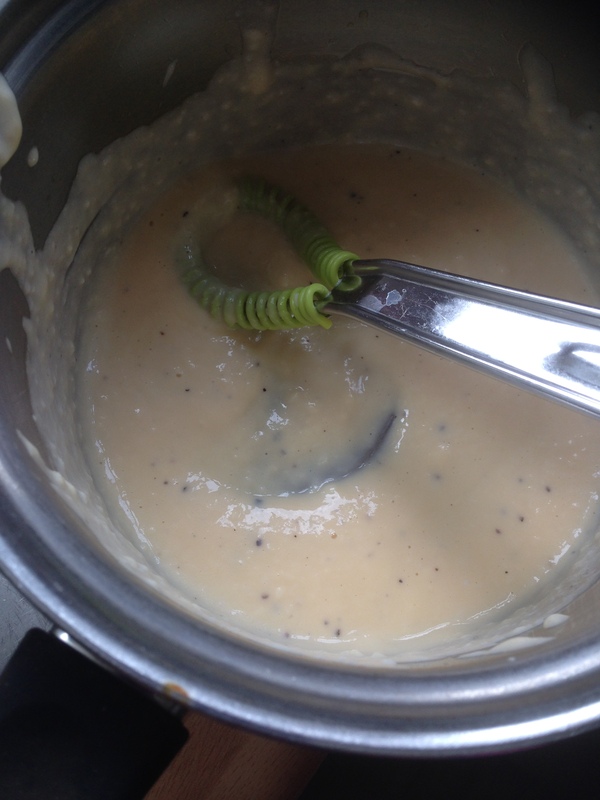 I fried the turkey and mushrooms and mixed into a thick white sauce. That was then piled into each case and then back into the oven for another 15 minutes..
We were having these with a glass of prosecco before dinner and are rather good. The pastry isn’t as light and flaky as it should be but still tastes good. The filling is good, nicely seasoned sauce helps hold that all together. Would I make these again? Yes but I’ll be slightly less heavy handed with the pastry next time!! 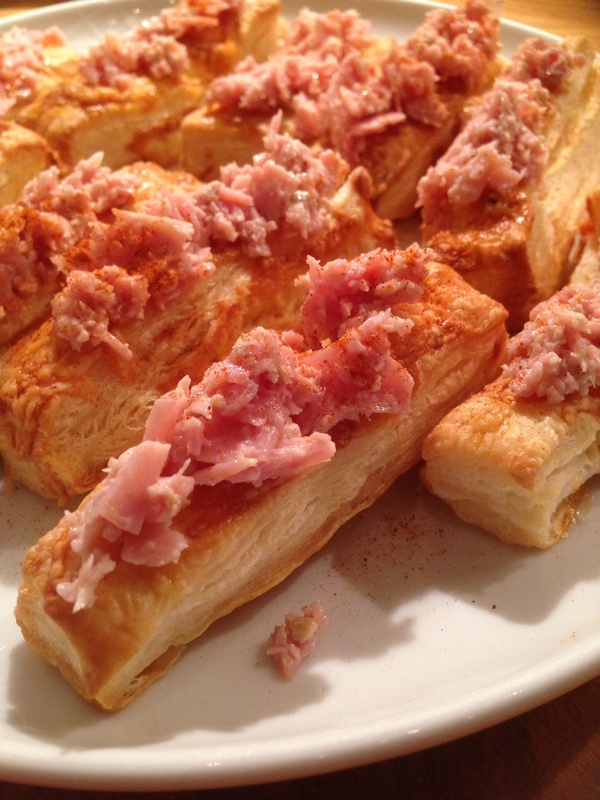 Never heard of a dartois before, but I wanted an appetiser for a dinner..
After a bit of googling I did find a few other recipes and images and they were pretty similar and it gave me a good idea of what my end product should be! I was making both as I had half a can of anchovies in the fridge that needed using, and I wanted to convince my family that they don’t taste that bad!! 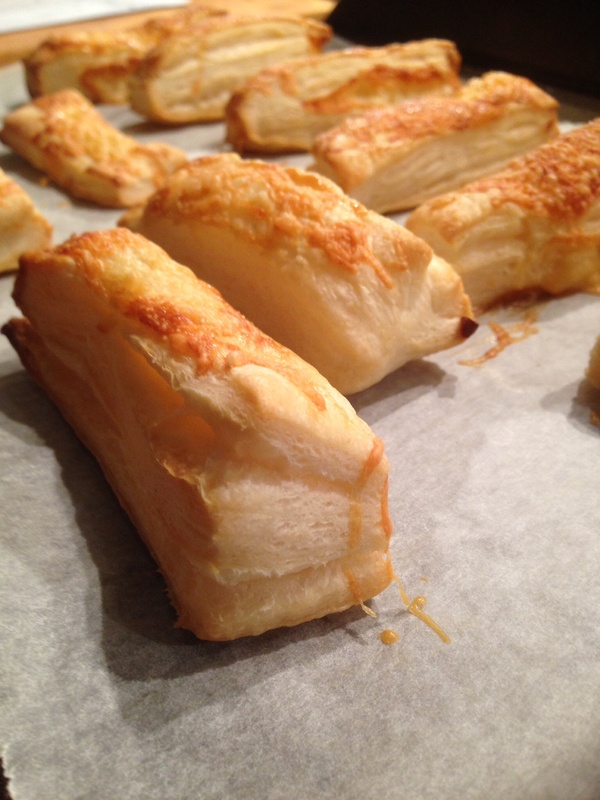 So first I made the flaky pastry which obviously the recipe for that comes from the pastry chapter! I was making 4oz of pastry so halved all these ingredients. I do have some lard in the fridge so opted for a lard/butter mix. It was harder than expected getting the lard and butter mixed together..
Once they’ve been worked together I rubbed a quarter of it into the flour..
After a bit of kneading and mixing it does end up in a very workable dough, it was easy to roll out and not too sticky.. So the recipe says to put another quarter of the butter mix onto the pastry in flakes like buttons on a card. Well am not too sure what it means by buttons on a card, and it’s not exactly flakes, more like splodges..
After a bit of folding and rolling I left the pastry to rest in the fridge. It did all get a bit sticky by the time all the butter had been incorporated. While that was resting I made the filling. I mixed the egg and butter together, which is actually not an easy thing to do!! It was a disgusting lumpy mess! 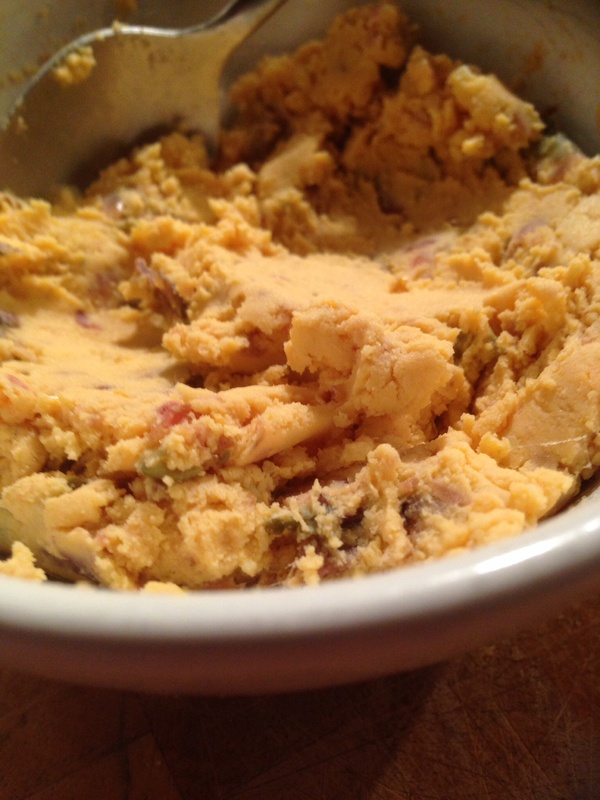 I halved that mix and to one half I added cheese and to the other I added mashed anchovies. Once the pastry had rested I started rolling it out. First square was topped with the anchovy paste..
Then I made another square and that was topped with the cheese mix..
Each one was topped with another square of pastry which was then brushed with egg and marked into fingers..
After about 20 minutes in the oven they were looking nicely golden-brown..
Each one was cut into fingers..
Well these were great! The pastry is very flaky as you would expect but it’s really good! 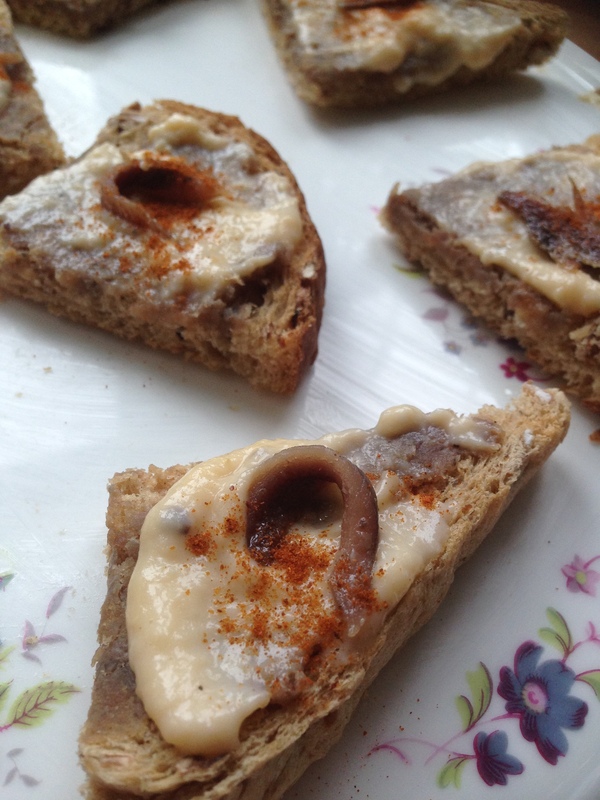 I loved both fillings, the anchovy one is quite strong but I did really like it, and think the others in my family enjoyed it too! The cheese one is fab as well! I couldn’t pick a favourite and that fact that they were polished off in a matter of seconds has to be a good sign!! Would I make these again? Yes definitely..
Tonight I was making a pre- dinner nibble and the book has a whole list of suggestions.. This is the only one that has a real recipe involved..
First off I couldn’t decide what unsweetened cereal would be good in this, the only one I thought would be suitable was all-bran, but then that doesn’t really fit with the nuts and bolts! I thought I should be using something round to be the bolt to go with the pretzel as the nut! I was going to use Cheerios but pretty sure they’ve been sweetened! 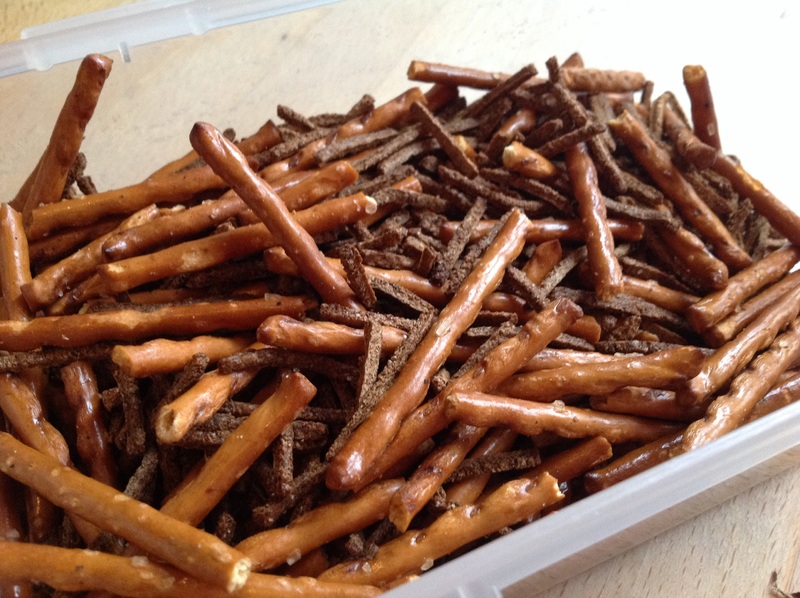 So anyway I opted for all-bran with the pretzel sticks.. I do love pretzels, and probably prefer them to crisps, so to mess about with them and have them bake in the oven does seem like an unnecessary process to me! After 15 minutes there didn’t seem like too much of a change, they were slighty darker but I didnt have time to leave in any longer.. 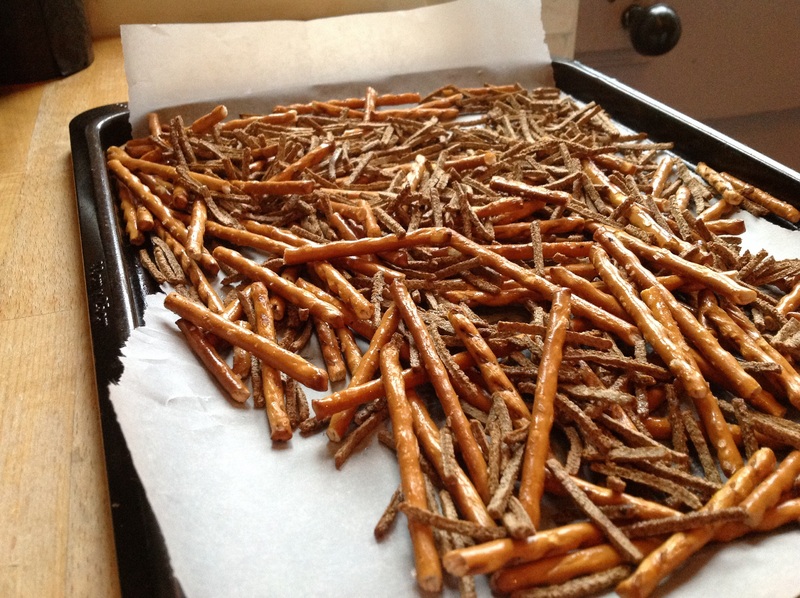 I honestly didn’t get the differnce with the pretzel sticks, they are salty and baked anyway so seems slightly pointless adding more salt and baking them again! The all-bran sticks did taste differnt! I don’t mind all-bran just as it is but once it’s been baked in the oven with some butter and salt it does taste a load better! So this was something different to nibble with a pre dinner drink but to be honest I probably wouldn’t waste my time doing this again and would quite happily eat the pretzel sticks just as they are and save the cereal for breakfast! Would I make this again? Doubtful.. It doesn’t actually advise on a quantity of pastry, I didn’t weigh what I had but I guess you could alter the other ingredients based on how much you have. I did use the full quantity of everything else. 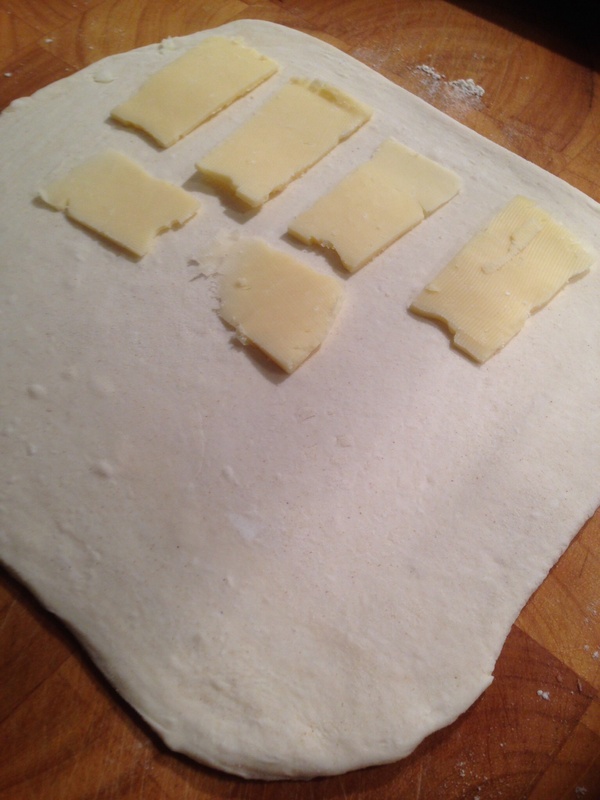 First off I rolled out the pastry and put the cheese on top. I probably could’ve sliced my cheese a touch thinner..
Then I rolled out again and cut into fingers.. The recipe does say to roll out very thinly and I did think I could’ve rolled mine a bit thinner. 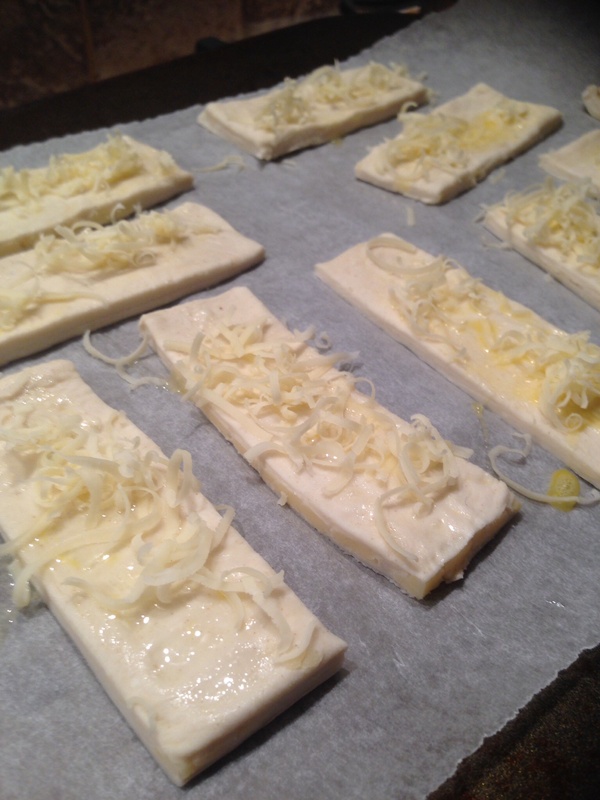 Then they were brushed with egg and topped with more cheese.. Most of them puffed up quite considerably! I had to press them down a bit otherwise it would’ve been impossible to spread anything on them! 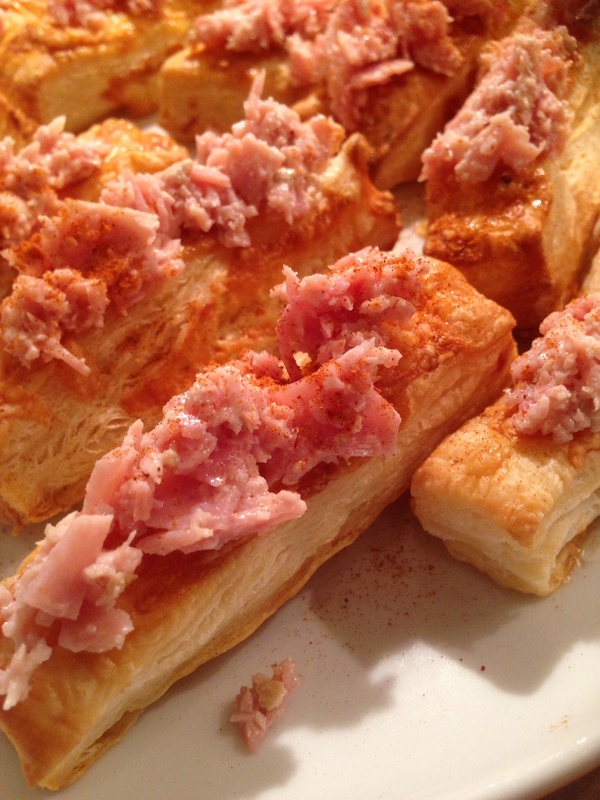 I do love horseradish but I didn’t want to add too much, I opted for a teaspoon to mix with the minced ham..
Once the pastry fingers had cooled I spread some of the ham mix over each one and then sprinkled over some paprika.. So they aren’t the prettiest canapé, I probably could’ve refined them a wee bit! I thought these were really nice served with a glass or two of prosecco! 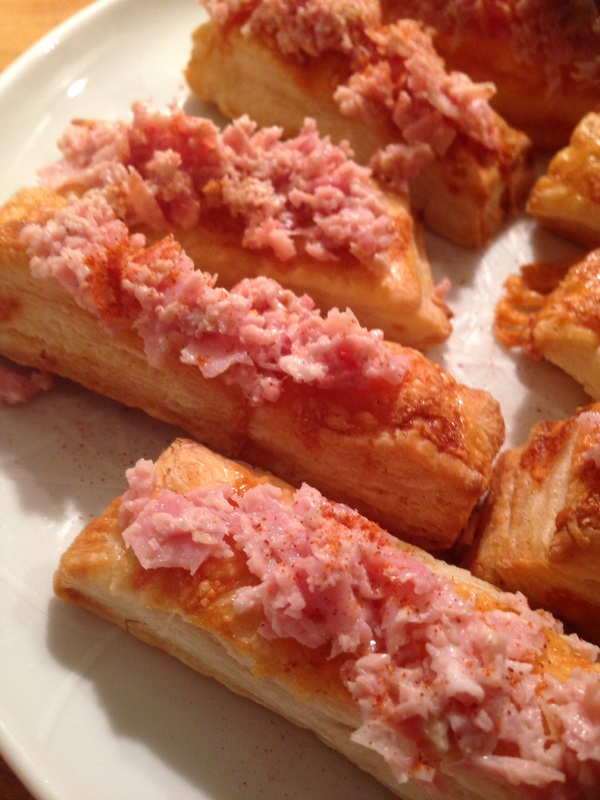 The cheesy pastry is good and then the ham with the horseradish sauce is a great topping. I think it could take even more horseradish sauce but then maybe that’s just my preference. Overall though these were good! Would I make these again? Yes I would. I started off boiling the eggs, and opted for nearer 10 minutes to make sure they were hard boiled. 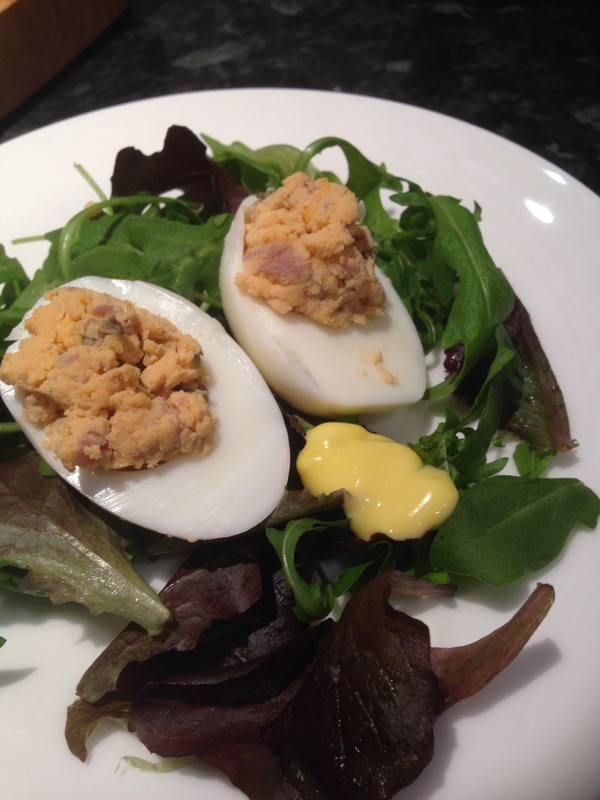 So then I mashed all that with the egg yolks. Took a good bit of mashing to get anything resembling a paste! So it doesn’t look very nice just now but I did have to try it and it’s actually quite pleasant. 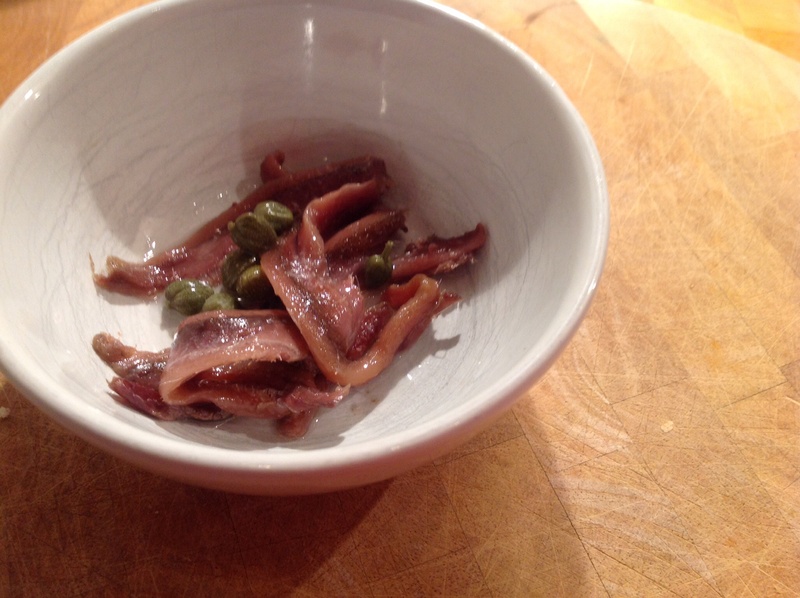 Once the anchovies have been thoroughly mixed throughout everything they actually add quite a pleasant flavour! Then it was back into the egg whites.. I served this on a mixed salad and had some smoked garlic mayo on the side but didn’t have any parsley to sprinkle over the top! I was worried my friends were going to hate this and not invite me back but I think they were pleasantly surprised too! Would I make this again? Maybe! !